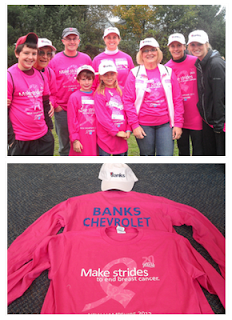 Banks participated as a Gold Corporate Sponsor for the October 14th Making Strides 5-mile walk. 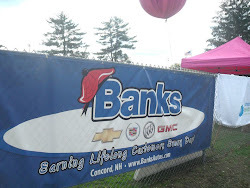 In addition, our "Banks Chevrolet" team raised $5,629.71 for breast cancer, and the Concord event as a whole raised a total of $613,763! Thank you to those of you who walked, donated or supported our team members. Thanks to the support of the Making Strides breast cancer walk, the American Cancer Society is doing the most in every community to help people with breast cancer today and striving to find cures to end the disease tomorrow. For more information, please visit makingstrideswalk.org. 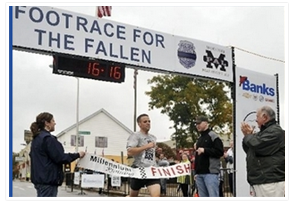 The Manchester Police Athletic League organized the sixth annual Footrace For the Fallen 5k road race on October 14th. This event honors the Manchester Police Department officers who were killed in the line of duty, and was started as a dedication to Officer Michael Briggs. Banks was happy to support this event by participating as a Bronze Sponsor. Nashua Police Officer Joseph DeWitt crosses the finish line as Manchester Police Officer Dan Doherty and Mayor Ted Gatsas watch DeWitt take first place overall.